At least 19 people have been killed and 45 more injured in a knife attack at a home for the disabled in Japan. According to reports, a knife-wielding man broke into the building in the city of Sagamihara, west of Tokyo on Monday. The staff of the institute notified police who arrived and arrested the 26-year-old suspect, reported to be a former employee at the facility. Police have yet to formally establish a motive for the attack. However, Uematsu was put in hospital earlier this year for almost two weeks after he said he would kill disabled people. 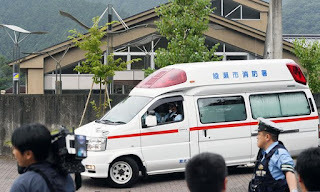 Authorities said Uematsu had been “involuntarily committed” to hospital on 19 February, after police in the town of Tsukui contacted him in response to a letter he had attempted to pass to the speaker of the lower house of Japan’s parliament. He was released from hospital on 2 March.